Flash-based external direct-attached storage (DAS) devices have evolved rapidly over the last few years. Starting with simple thumb drives that could barely saturate USB 2.0 bandwidth, we now have high-performance external SSDs that take advantage of the USB 3.1 Gen 2 interface to saturate the internal SATA bandwidth. The introduction of PCIe-based SSDs have enabled mass-market storage devices to break the SATA barrier. The proliferation of Thunderbolt 3 (that drives up the available bandwidth by a factor of four compared to USB 3.1 Gen 2) has ensured that the full performance benefits of the internal PCIe interface can be made available in external devices. 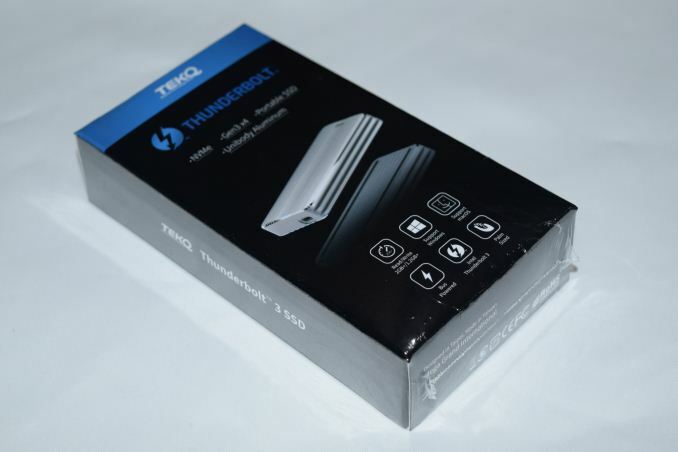 A number of high-performance direct-attached storage (DAS) devices have attempted to take advantage of the benefits of Thunderbolt in the last few years. However, they have either required external power adapters (such as the LaCie d2 Thunderbolt 2 SSD Upgrade), or, in the case of bus-powered devices, been held back by an internal SATA SSD (eg. : LaCie Rugged Thunderbolt). The pricing of such devices have also restricted them to the high-end / professional market. In this context, the introduction of a reference platform by Phison at CES 2018 is sure to address the shortcomings of the current external Thunderbolt SSDs in the mainstream market. TEKQ has been in business as a manufacturer of Apple MFI-certified peripherals for some time now. They are new to the direct-attached storage space, but, their first product in that market segment - the Rapide Thunderbolt 3 External SSD - leapfrogs most of the other bus-powered alternatives in the market in terms of both performance and pricing. There is nothing preventing advanced users from installing their own M.2 PCIe SSDs in the internal M.2 slot. However, TEKQ plans to sell the Rapide in three different capacity points - 240GB, 480GB, and 960GB. Based on our teardown, the internal SSD doesn't seem to be a branded one. Instead, it appears to be a Phison reference design using the E7 controller along with Toshiba's MLC NAND flash. Unlike similar products such as OWC Envoy Pro EX / EX(VE) that are available for retail purchase right now, TEKQ has opted to go for the crowdfunding route to garner more exposure prior to a wide market release. As a matter of policy, AnandTech does not cover crowdfunding projects. There are very few exceptions - most of the ones that pass our bar are ones where the product is close enough to the launch that manufacturers are ready to have us post a hands-on review of the product. The TEKQ Rapide is one such device. TEKQ's crowdfunding initiative will go live on Feb. 21, 2018. TEKQ sent over the 240GB variant for review. In addition to the main unit, a 0.5m Thunderbolt 3 cable (certified for 40 Gbps operation) is also bundled. The TEKQ Rapide is around the size of a credit card, and weighs 135g. 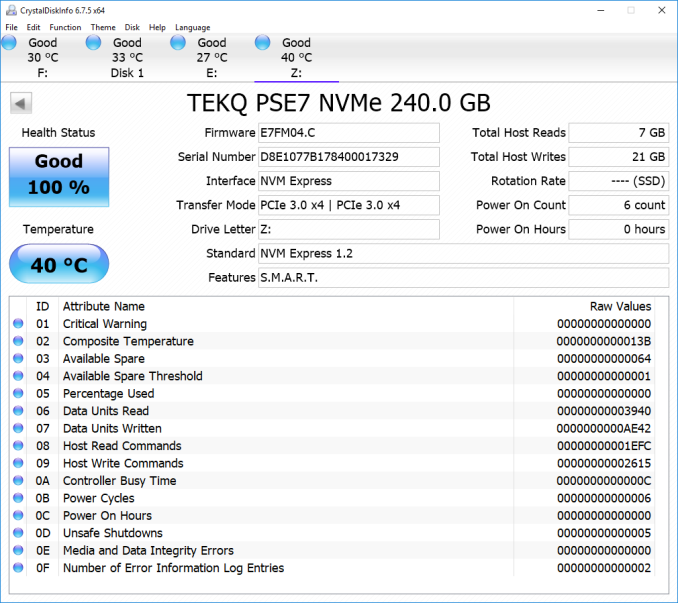 With TEKQ's own internal SSD solution, read/write speeds of 2700 MBps / 1500 MBps are claimed, with the random read/write IOPS coming in at 300K/250K respectively. Even though CrystalDiskInfo puts only SMART in the features section, we will see later on that TRIM is also supported. The Thunderbolt link is essentially invisible to the tool, with NVM Express listed as the interface. For all practical purposes, the TEKQ Rapide SSD is a PCIe 3.0 x4 NVMe SSD in the system. The TEKQ Rapide is easy to disassemble, with four screws hidden under the rubber feet on the underside of the chassis. The gallery below has pictures of the chassis as well as the internal design and M.2 SSD. The Phison controller and the Toshiba MLC flash are easily seen in the M.2 SSD. The design includes thermal pads for both the M.2 SSD and the Thunderbolt 3 controller. As we shall see later on, the thermal solution is very effective in keeping the internal temperatures under check even under stressful conditions beyond what a consumer-focused DAS unit might endure. The TEKQ Rapide is plug-and-play except for the small matter of allowing Thunderbolt security to allow one's system to act as a host for the device. 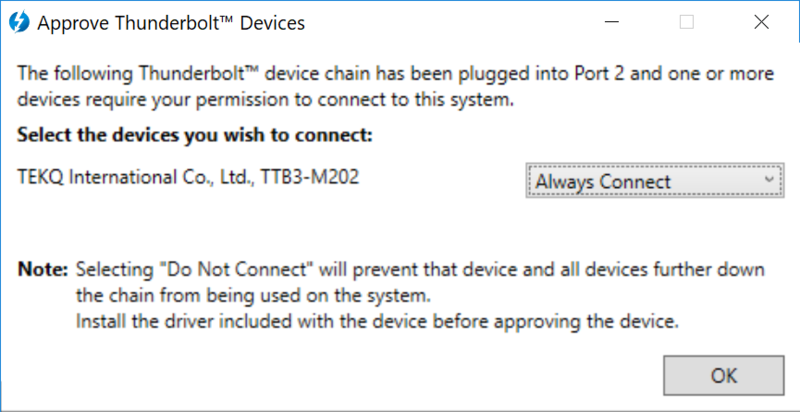 Once approved (needs to be done only once per system if the 'Always Connect' option is chosen), the device mounts as a exFAT volume. This allows for compatibility with both Mac and Windows devices. Since the Thunderbolt 3 / NVMe SSD breezed through our benchmarks in very little time, we were able to evaluate the unit with the volume formatted in exFAT and NTFS. 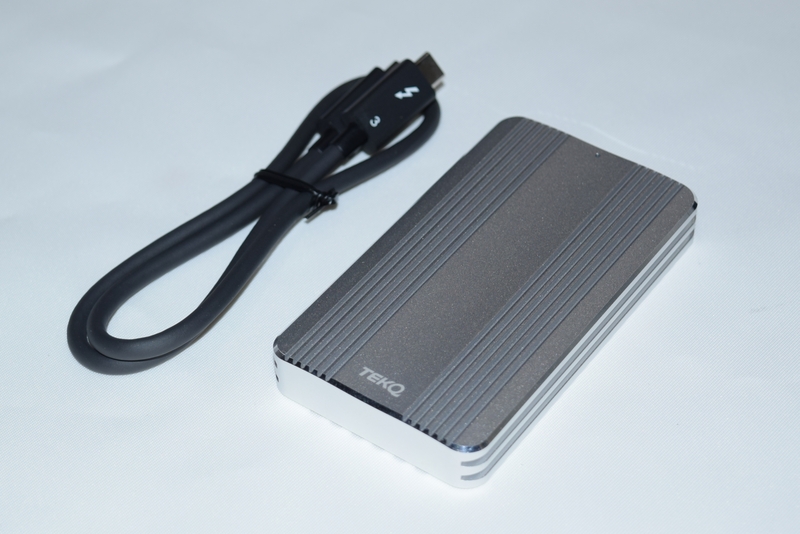 Unlike some of the other portable SSDs in the market that come with value-adds such as hardware encryption support, the TEKQ is currently keeping it simple. Despite the underlying platform (Phison E7 reference design with Toshiba 15nm MLC flash) supporting AES-256 with TCG / Opal 2.0, the feature doesn't have any user-friendly way to get activated. I'd actually love to buy enclosure by itself. USB 3.0 to M.2 AHCI adapters are widely available in rather funny prices, while for obvious reasons USB to NVMe are not available at all. I'll second that motion, and also put in a request for a U.2 version of the same. As far as I know U.2 (or rather SFF-8639) actually supports hot plug by itself. You can easily drop in external port trough PCI bracket, tie in some power delivery and voila, You'd only need to 3D print or rig some kind of enclosure, or repurpose 2.5" 15mm SATA one. But again, there is the power requirement.